The comet 67P/Churyumov-Gerasimenko, as seen by Europe's orbiting Rosetta spacecraft on March 22, 2015. The outbursts of water vapor seen emanating from comets are fueled by subsurface ice reservoirs, a new study suggests. Observations by the European Space Agency's Rosetta spacecraft show that surface ice on Comet 67P/Churyumov-Gerasimenko, which Rosetta has been orbiting since August 2014, appears and disappears on a daily cycle tied to illumination by the sun. "We think that this cycle is able to replenish the surface layers of ice from the interior of the comet, sustaining the activity for many diurnal cycles," De Sanctis told Space.com via email. "Small outbursts have been observed on other comets at the morning terminator (dawn), and this is possibly due to a cyclical phenomenon such as the one we see. 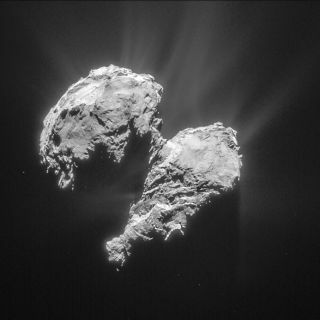 Thus, this cycle could be common on comets." De Sanctis and her colleagues analyzed data gathered by Rosetta's Visible and Infrared Thermal Imaging Spectrometer (VIRTIS) in the "neck" region of the rubber-duck-shaped Comet 67P. They found that ice abundance on the surface waxes and wanes locally on a daily basis, according to whether the region in question is in sunlight or shadow. The daily illumination cycle also drives the outgassing of water. "When the surface is illuminated, water ice sublimates mainly from the uppermost surface layers," the researchers wrote in the study, which was published online today (Sept. 23) in the journal Nature. "When the surface goes into shadow (or into the night side), a temperature inversion occurs between the now colder surface layer and the interior layers, which maintain a higher temperature for a longer time." Some of the water vapor sublimating from the warmer near-surface layers of Comet 67P (and, presumably, other comets as well) recondenses on the frigid surface, De Sanctis and her team said. "By this mechanism, the surface layer becomes enriched in water ice," they wrote. "The water ice in the uppermost surface layers will be stable until a new cycle of solar illumination starts, which will increase the surface temperature and thus trigger again the outgassing of water from the comet." The Rosetta mission is revealing a great deal about 67P's composition and structure — information that should yield insights about the early days of the solar system, team members have said, because comets are icy remnants left over from the planet-formation period more than 4.5 billion years ago. Comet 67P made its closest pass to the sun last month, coming within just 114.9 million miles (185 million kilometers) of our star on Aug. 13. Rosetta will continue studying the comet from orbit through September 2016.